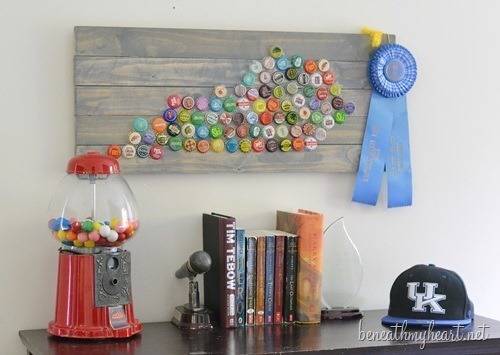 Today I want to share with you four DIY projects that are great for any boy’s room! All of these projects come from the makeover I did in Jonathan and Luke’s room 5 years ago, but I think they have stood the test of time. 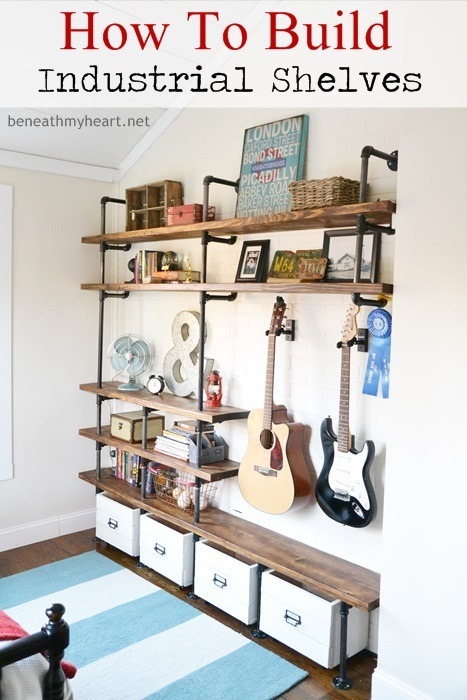 I know you see industrial pipe shelving all over Pinterest and the internet nowadays, but five years ago, it was still pretty new. After building Jonathan’s shelves, I used the same process to create individualized shelves for Luke’s side of the room. 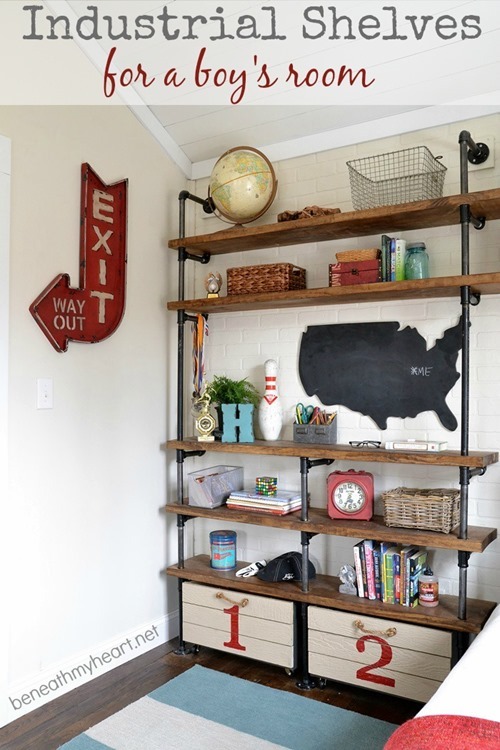 The best part of the type of shelves is how customizable they are. We created Luke’s shelves so that his bed could sit underneath them, but you could use that space for a desk or dresser as well. In the middle of the room, between their two beds, I created a little “workspace” for both of them by building a DIY Sawhorse desk. This type of desk is so easy and so inexpensive. I covered the plywood desktop with chalk paint so the boys could draw or write reminders on it. 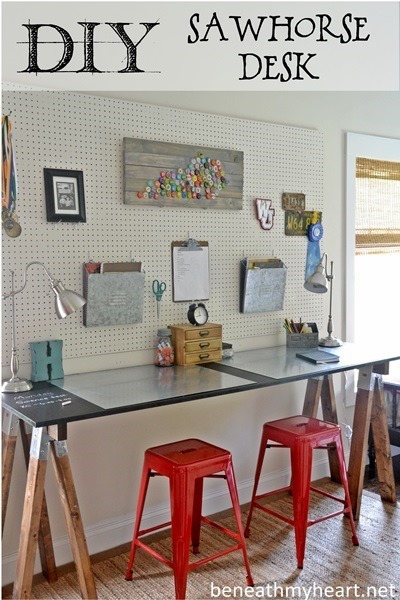 The pegboard wall was great for them to display their treasures and organize their stuff however they wanted. 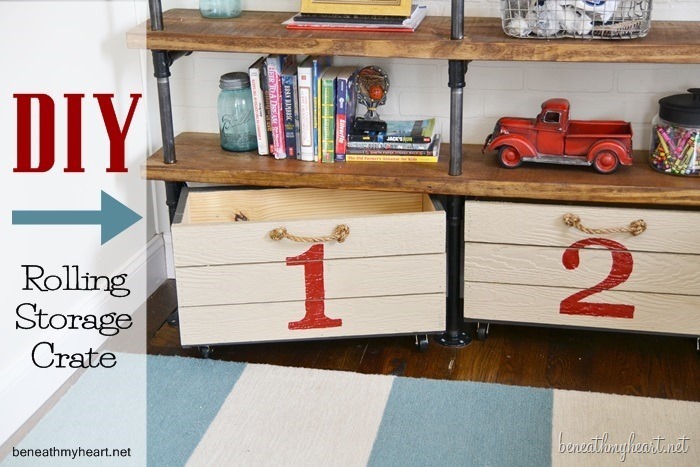 Lastly, I wanted to share with you how we made these DIY rolling storage crates. Whenever people find the tutorial of how to make our industrial shelves on Pinterest, their next questions is always, “Where did you buy those crates?” haha! It’s been five years since we made these shelves, but we still love them. Now that Jonathan is living in Nashville, Luke has the whole room to himself, and the shelves look completely different. haha. Luke will be 17 in September, so the shelves look a little less “boyish,” if you know what I mean. I’m thinking we will probably eventually move Adam and Eli into this room, when Luke goes to college. We’ll see…. Which of these projects is your favorite? « My Home is Featured in Cottage Style/Vintage Style Magazine! Wow!!! So great. You are soooooo talented. Love them. Oh just beautiful. You are both so talented. Can you show a tutorial on how to construct this industrial look. Love everything about that room!! Where did you get the bed?